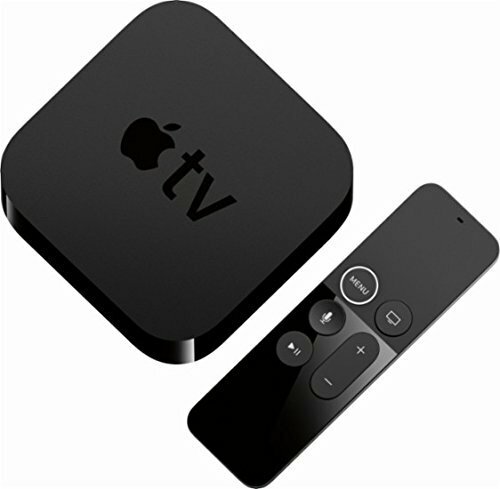 • 4th Generation Smart TV Box..
• Supports voice search by simply asking the Siri Remote. • Experience High Definition 1080p premium quality videos. • Dolby Digital Plus 7.1 surround sound..
• Equipped with built-in smart A8 chip..
• Supports videos and photos from iPhones, iPads and other smartphones..
• MPEG-4 videos up to 2.5 Mbps, 640 by 480 pixels..
• Enjoy TV shows, movies and games..
• Great entertainment contents from iTunes and other apps like Netflix, Hulu and ESPN..
• Make use of Siri Remote Control to look up for whatever you want..
• Overall Size/Dimension: 5.3 x 6.4 x 2.6 inches..